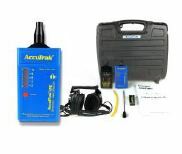 The AccuTrak VPE represents state of the art technology for pinpointing leaks in air conditioning and refrigeration systems. The VPE is extremely sensitive to the ultrasonic sound of a turbulent gas leak. Reliability Direct, Inc. Your Direct Source for Reliability, Maintenance, Test & Measurement! Will NOT false alarm from residues or stray gasses. Detects ANY gas, even Vacuum! No tips to clean or sensors to replace.